Saturday, Nov. 11 | 8 a.m. to 12 p.m. The Lyons Fire Protection District will be hosting a hazardous material training at the wastewater treatment plant parking lot, on Saturday, Nov. 11, from 8 a.m. to noon. The training will employ a simulated fire scenario, with water spraying and digging. Monday, November 13 | 10 a.m. Please join the the Town of Lyons Recreation Program, as they bring in special guest instructor Betsy Hubner to teach a painting class. Please bring a 4X6 photo or photocopy that you would like to use in your creation to keep for yourself or make as a gift. You must register for the class with the Town of Lyons Recreation Program at least three days prior to the class. The bright glow of the holidays will kick off in Lyons on December 2! The highlight of the weekend is sure to be the Holiday Parade of Lights on Saturday, December 2. The parade will start at 6:30 pm and will be filled with illuminated, colorful floats, many of which will be decorated in the theme of this year’s parade — “Peace on Earth”. Learn more and sign up today! 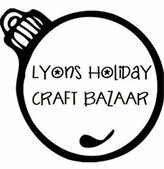 Dec. 2, 10 a.m. to 5 p.m.
Dec. 3, 11 a.m to 4 p.m.
Over 60 artisan crafters will sell handmade wares in the Lyons Elementary School Gym at the 43rd Annual Lyons Holiday Craft Bazaar! Mark your calendars for December 2 from 10 a.m. - 5 p.m., and December 3 from 11 a.m. - 4 p.m.. There will be visits from Santa Claus on Saturday from 3 - 5 p.m., and on Sunday from 2 - 4 p.m.
A wide variety of quality crafts, jewelry, photography, pottery, glass, and textile arts are found at this eclectic event. What’s more, it’s a great opportunity to find unique holiday gifts and accessories. Last year 1,300 shoppers attended. This is a Lyons-area tradition not to be missed! Nov. 16 | 6 p.m. In conjunction with Boulder County Health and Human Services and Connect for Colorado, the Lyons Regional Library is opening the library on Thursday, Nov. 16, for a Q&A information session with Janaki Jane and Chandler Budlong-Springer from Connect for Health. This event is for anyone who has questions at all about the ACA. How has it changed? How does it work? How much does it cost? What's happening with the ACA? This is not an ACA sign up event although Chandler and Janaki can make appointments with those who wish. The November Project is an effort to bring hope, encouragement, and solace to anyone experiencing adversity in their lives. Started by Lyons musician, Ian Brighton, in November of 2016, the project began in the form of an audio diary and has evolved into a collaboration with over 12 musicians. The original inspiration for the November Project is Ian's son, Michael Brighton. Michael has a congenital heart defect and Down Syndrome. He's faced hurdles in his young life, but he continues to inspire everyone with his amazing spirit and infectious smile. Proceeds from the November Project will go towards the Cardio-Intensive Care Unit (CICU) at Children's Hospital and the Sie Center for Down Syndrome. Thanks to the generosity of our artists, we will be donating from ticket sales; and we will be collecting cash and check donations at the show. November 19 | 10 a.m.
Don't miss your chance to enter your Pumpkin, Fruit or Pecan Pie for a chance to win the title of Best Pie Baker in Lyons! Call or stop by the Stone Cup to sign up, 303-823.2345. Bring 2 pies (one to sell and one for the judges) by 10 a.m. on Sunday, November 19. The winner will be announced by 3 p.m. The pies will be judged by the customers (starting at 11 a.m.) for a popular vote and by a panel of distinguished judges. 100% of the proceeds donated go towards the 2017 Lyons Holiday Parade of Lights. Writing in November - WIN! 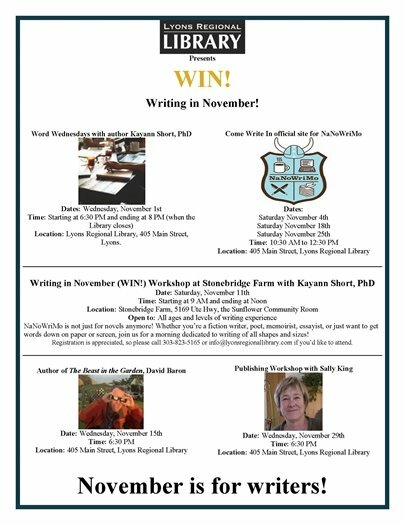 During the month of November, Lyons Regional Library supports every kind of writer with its Writing In November programs. Please do not reply to this email, as we are unable to respond to inquiries sent to this address. 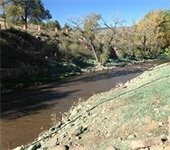 Please direct questions to the Town of Lyons.